Mr Toad from Wind in the Willows may have been a few sandwiches short of a riverside picnic. But I find it hard not to side with him when it comes to his love of travel. This made a trip to the Killerton estate near Exeter essential this Christmas. Here the National Trust is giving visitors a glimpse into the world of Mr Toad and his friends Ratty, Mole and Badger. Killerton is one of the largest estates looked after by the National Trust – 10 square miles in all. But on a chilly Sunday afternoon our focus was on visiting the Georgian house and a wander around the gardens. If you’d like to find out more about the wider estate you can read about our visit during warmer weather. When you arrive at Killerton for Wind in the Willows you need to pick a time to go into the house. Book in advance to avoid disappointment and get the time you want. We were lucky and had a good choice of time slots. Groups are admitted every 15 minutes to help with the flow of visitors through the house. As you approach the mansion from the stables you’re greeted by rattan reindeer, carolling mice and bauble decked trees. On the day we visited a brass band was also playing outside the house, which added to the atmosphere. Inside the house was decked with scenes from this classic children’s tale by Kenneth Grahame, with 12 tiny badgers hidden around the house for children to spot. The girls thought Mr Toad was ever so naughty for crashing his car and loved dressing up in woodland and fairy inspired costumes. 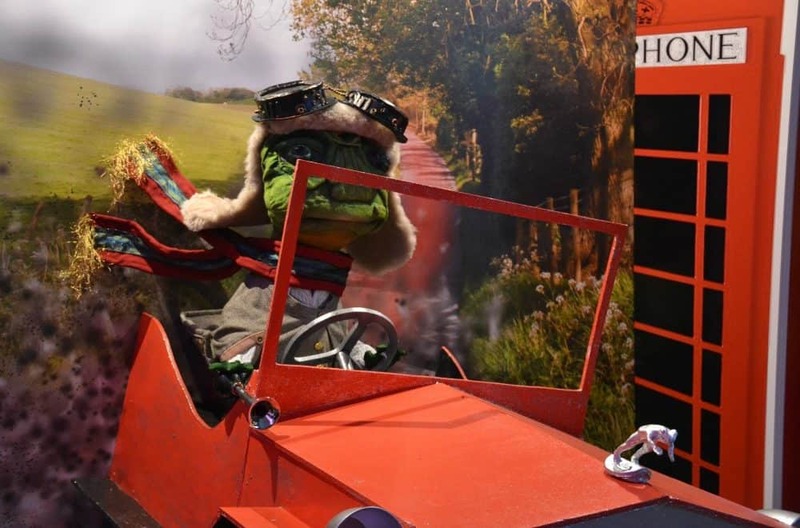 Outside there’s a Wind in the Willows-themed activity trail that takes you on a walk through the grounds. At night the trail is illuminated until 8pm. The girls loved whacking moles, hooking ducks and rowing boats, as well as the essential National Trust activities of playing on tree swings and clambering over logs. A visit to Killerton’s Bear House – although not technically on the activity trail – is also a must! At the end of the trail we saw carollers in the Chapel, which was the perfect way to complete our visit. You can see a bit of this in the video at the top of this post. Book your slot to view the house in the busy weeks running up to Christmas. On selected dates in December Santa will be waiting to greet children in his Stable grotto. Booking to see the big man is essential. Visit at a weekend and you might also be treated to live music. Expect the cafes and restaurant to be busy. You can book the restaurant at the house in advance but over Christmas the menu is a three course sit-down meal, so not the best option for families with fidgety kids. On the day we visited the Dairy Cafe at the house was closed, so if you’d like to grab a sandwich here check with reception first. We ate in the courtyard outside the Stables Cafe as there was no seating available inside. Wind in the Willows is on at Killerton until 5 January 2018. Are you visiting any National Trust properties this Christmas? Do you fancy Wind in the Willows at Killerton?